Vrrrooooom! Psssssst! VRRROOOOOM! Psssssst! Cars and perfume — I don’t get the connection. I’ve certainly never been drawn to a cologne by images, or the "allure", of a race car (or driver), a jeep, an SUV, or a vintage sports car. Nevertheless, I was curious to smell what H2 by Hummer had to offer. H2 contains ingredients that I either love (mandarin peel, bergamot, cardamom, elemi resin, incense, myrrh) or can abide (cinnamon leaves, Bourbon pepper). How could this scent not please me? H2 starts with 'cold' and metallic citrus. The citrus smells unnaturally strong and unnatural; I do not get whiffs of mandarin peel or bergamot. The second, and final, stage of H2 starts about 20 minutes after application and it is warm and sweet with a hint of spice. In this stage, I can at last detect two distinct notes: cinnamon leaves and pepper. Unfortunately, I do not smell any myrrh, elemi, incense or cardamom. H2 is certainly a well-blended scent. When I started my perfume 'hobby' long ago, I thought the term "well blended" meant a great Nose had taken perfume notes and made a masterful composition from them: a well-blended composition that produced a multifaceted olfactory experience. These days, I think of a well-blended perfume as one in which fragrance notes are mixed in a way that blurs much of their individual character. Such a well-blended scent, even one containing 20, 50, or 100 ingredients, can end up smelling like a single perfume note to me (the smell of Iso E Super in Escentric Molecules Molecule 01 comes to mind). I usually do not like such "well-blended" perfumes – I prefer jagged edges, flares, oddity, metamorphosis. H2 is rather conservative in its approach; nothing about the scent sets it apart from the pack. It does not live up to its advertising slogan: Passion Meets Performance. Where's the passion? I was expecting something more daring, more throbbing, more "off the road"! As for performance, H2 is long lasting. While wearing H2, pondering the appeal of vehicles, I thought of one car image that would make an exciting perfume. Picture a laughing Isadora Duncan, head thrown back, racing along the Riviera in a sports car, her too-long neck scarves diaphanously trailing behind her, their hazy sheerness mixing with, trailing alongside, the wispy exhaust fumes. We know what's coming: entanglement, strangulation, death — tinged with the scents of 1927 Côte d'Azur, an over-the-top personality and a sports car (lemons, leather, tuberose, rubber, oleander, gasoline, roses, wax, musk and sandalwood, perhaps?). Call me morbid or overly dramatic, but if I must have car imagery fueling a perfume’s creation or advertising campaign, give me a scent with some tension, unease, excessive speed — not the steady hum of H2. H2 is made by Riviera Concepts Inc. (Toronto). Riviera Concepts creates, manufactures and markets scents for Alfred Sung, Lulu Guinness, Nanette Lepore, and Cynthia Rowley, among others. H2 was created by perfumer Vincent Schaller (of Firmenich) and the bottle was designed by Magali Sénéquier and Jérôme Dinand (who recently designed the bottle for Sillage de la Reine). 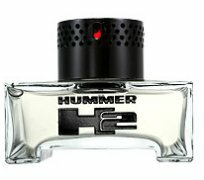 H2 by Hummer is available at sephora and many online discounters. Bummer, I haven't tried this Hummer Silly rhyme aside, I am not at all bummed since I fiercely dislike metallic citrus notes in a perfume, they always come across as artificial. I can understand how they might (and should, obviously) evoke the image of a car, but I much prefer your poignant (certainly not morbid) Isidora Duncan imagery! PS: It's strange that Demeter has not done a “BMW”-type scent, isn't it? “Metallic citrus” and “water/ozone” signify a HUGE number of men's department store colognes don't they? Not pleasant or original. A far cry from original, I should think. Anyway, I got my sample of the Aedes room spray – it's just stunning! Leather is quite pronounced on my skin and is weaved beautifully with incense and the slightest hint of vanilla. This is the first incense scent I've tried that actually comes close (to my nose, at least) to the one used in Orthodox religious service. I'm in love! Have heard raves about the John Galliano candle, but sadly haven't smelled it. I do burn incense sticks but so far not incense, though I have been thinking of getting some… Agree that Bach (ah) is perfect for the atmosphere! A friend of mine, who is a car restoration buff, loves it's black rubber/burnt tire scent.